The National Do Not Call Registry is meant to limit the number of annoying telemarketing calls people in the U.S. have to put up with. You can register online or by calling 1-888-382-1222, and it helps to get rid of some of the annoyance, but the pestilence of telemarketing and political recorded calls continues. On top of that law and registry, telemarketers are not supposed to call wireless numbers with an automatic dialer under all circumstances whether those numbers have been registered or not. But the annoying telemarketers and robotic systems keep violating both U.S. law and FCC regulations. You need a way to block them. 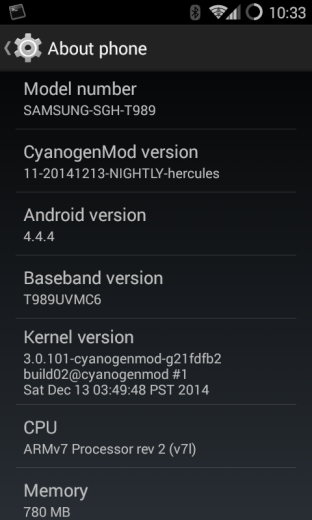 The good news is that CyanogenMod on an Android can do that easily! The program has proved quite popular: as of 2007, according to one survey, 72 percent of Americans had registered on the list, and 77 percent of those say that it made a large difference in the number of telemarketing calls that they receive (another 14 percent report a small reduction in calls). Similar laws have been established in Australia, Canada, India, Singapore, and the U.K., and there is at least a voluntary effort to maintain such a registry by marketers in New Zealand. But still the annoying calls keep coming. Many of them use faulty automated systems that call your number and then hang up a few seconds after you answer. Don't worry, they will call back tomorrow, and the next day, and the day after that, at the same time. 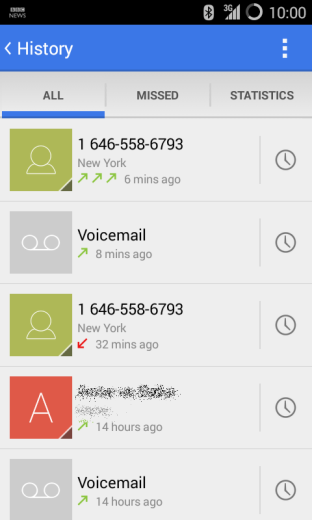 I recently received one of these annoying telemarketer calls from +1-646-558-6793, identified only as "New York". Well, I know some people there, and I do some business in the city, so it might have been legitimate. 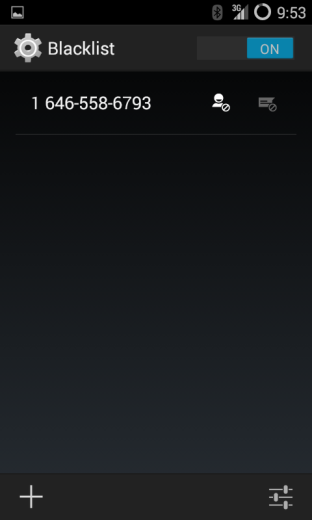 I had missed the call, but spotted it on my phone soon afterward. Start by going to your call history. You can see here that I got back to my phone about 24 minutes after the telemarketer had called. I checked my voice mail, then I tried calling them back. I tried three times as their message is very indistinct. 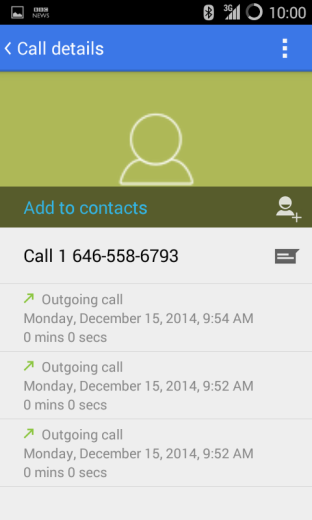 Click the small clock face at the right side of the call to bring up the details of that call. You will see what Andoid calls an "overflow menu" at the upper right. It's a vertical column of three squares. Click on that to bring up a menu of choices for this call. 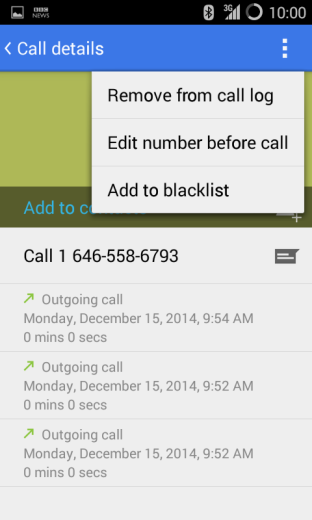 Click Add to blacklist to block that number from ever calling you again! If you realize that you blocked the wrong number, you can un-block it by selecting Delete from blacklist. When they call back, as these annoying telemarketers did the next morning, and the one after that, you get a silent notification. You can examine it at your leisure to see that you have been protected. 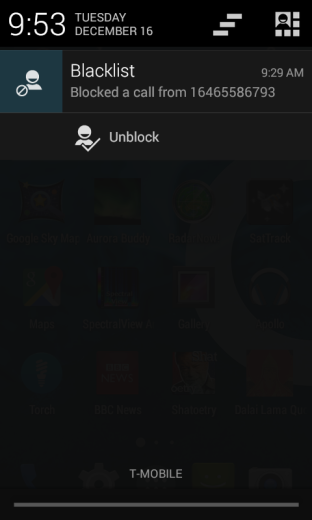 At that point you can click on "Blacklist" to examine the list of blocked numbers and un-block any if you want. You can also go to the blacklist by entering the phone app, using its menu, and selecting "Blacklist". You can manually enter new numbers, and you can even use wildcards. Some telemarketers use several numbers in a range to further annoy the public. You can fight back. 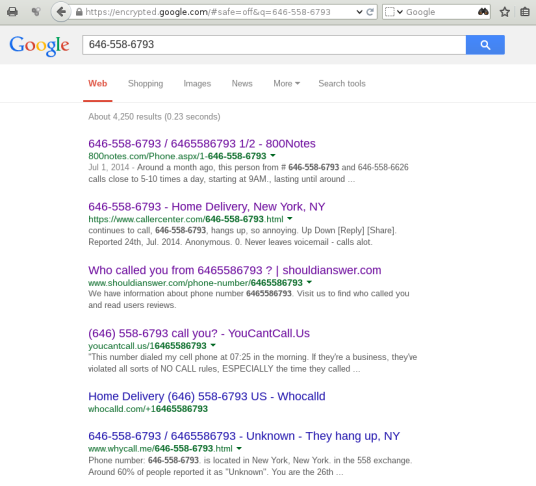 For example, 646-558-67* would block a range of 100 numbers from that exchange, -6700 through -6799. But be careful! You don't want to block an entire area code by accident! I did this on CyanogenMod 11. Slight variations of CyanogenMod version may change the appearance of these lists and menus, but this should help you to get the job done and block the telemarketing scum.